Want to be notified of new releases in liip/LiipMonitorBundle? This bundle provides a way to run a series of application related health checks. Health checks in the scope of this bundle go beyond simple actions like performing a ping to a server to see if it's alive. For example a Memcache server can be alive and not displaying any errors in your Nagios but you might not be able to access it from your PHP application. Each health check should then implement some application logic that you want to make sure always works. Another usage can be testing for specific requirements, like availability of PHP extensions. Another design goal of the bundle was to be able to perform the checks using the same configuration and environment that your application is using. In that way you can make sure that if the health check runs successfully then your app should work too. So each health check will be a class that will implement the CheckInterface::check method which must return a CheckResult object. What happens inside that method is up to the check developer. Health checks are defined as Symfony services and they have to be tagged as liip_monitor.check in order to be picked up by the health check runner. This gives a lot of flexibility to application and bundle developers when they want to add their own checks. Checks are run via the command line using a Symfony command or via a REST api that delivers the results in JSON format. See Writing Custom Checks for instructions on creating a custom check. The important bit there is to remember to tag your services with the liip_monitor.check tag. By doing that the check runner will be able to find your checks. Keep in mind that checks can reside either in your bundles or in your app specific code. The location doesn't matter as long as the service is properly tagged. The alias is optional and will then simply define the id used when running health checks individually, otherwise the full service id must be used in this case. If your app's service definition is using autoconfigure to discover services then classes which implement ZendDiagnostics\Check\CheckInterface will be tagged automatically. See "Full Default Config" below for a list of all built-in checks and their configuration. There are two default reporters: ArrayReporter for the REST API and ConsoleReporter for the CLI command. You can add additional reporters to be used by either of these. It is possible to group the health checks for different environments (e.g. application server, cron runner, ...). If not specified differently, all health checks belong to the default group. This creates two groups, default and cron, each having different checks. Both CLI commands have a --group=... option. If it is not given, the default group is used. Both commands, monitor:list and monitor:health, have an option --all to list or run the checks of all registered groups. Additionally, the monitor:list has an option --groups to list all registered groups. 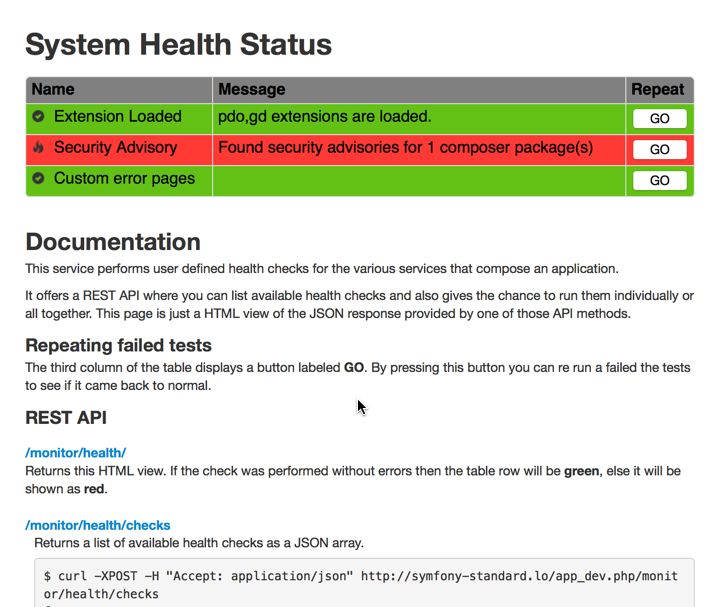 For documentation on the REST API see: http://myproject.org/monitor/health/. Don't forget to add the bundle routes in your routing.xml file. You can find a simple Nagios check written in Perl and Python in the Resources/scripts directory. Any flags can be combined except -A and -H. THe -u and -p flags should always be used together. The Python version depends on the nagiosplugin library < 1.0.0. And place your host within the Symfony2 hostgroup.